On this dark night, with my illuminated pumpkin grinning out at the night and a witch’s hat perched on my head, I thought I would write a little post combining a few of my favourite things: food & drink, books and Hallowe’en. Hello again Dragons and Jetpackers! Welcome to episode #4 of Sir Lancer recommends. 1967: Ye Wenjie witnesses Red Guards beat her father to death during China’s Cultural Revolution. This singular event will shape not only the rest of her life but also the future of mankind. Four decades later, Beijing police ask nanotech engineer Wang Miao to infiltrate a secretive cabal of scientists after a spate of inexplicable suicides. Wang’s investigation will lead him to a mysterious online game and immerse him in a virtual world ruled by the intractable and unpredicatable interaction of its three suns. This is the Three-Body Problem and it is the key to everything: the key to the scientists’ deaths, the key to a conspiracy that spans light-years and the key to the extinction-level threat humanity now faces. 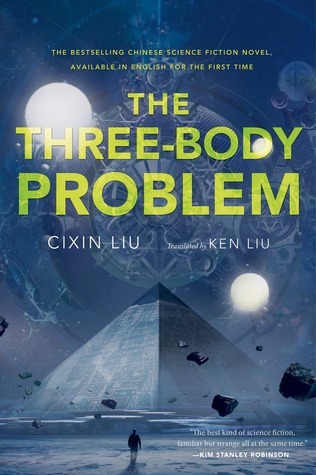 The Three Body Problem is a hard science fiction novel by Chinese author Cixin Liu or Liu Cixin, I have seen it written both ways and I am not familiar with the Chinese protocol for names. It was the winner of the 2015 Hugo Award and was nominated for the 2014 Nebula Award, so it had to be good – right? Well, maybe at one time, but as of late it seems as if the awards – all awards – have become politicized and not necessarily the best entry is chosen. But that is a discussion for another time. At the very least, I thought The Three Body Problem deserved at least a chance to prove itself. While I do not think the novel was worthy of an award, I did find it had some merit and well worth the read. The story takes place in China, and the beginning deals with the cultural revolution of the 1960’s. I must admit that I know very little of China’s history, or what life is like in China at all, and I found the history lesson fascinating. I could not see the relevance of these seemingly disjointed segments, but by the time the novel ended everything fell into place. In fact, the main plot line did not become evident until shortly after the halfway point of the novel. But after the slow start, things picked up fairly nicely and became more interesting to me. The characters, with the exception of the astrophysicist Ye Wenjie and the police detective Shi Qiang, were flat and one-dimensional. The dialog seemed clipped and at times forced, but I am giving the author the benefit of the doubt due to translation restraints. I can sympathize with Ye Wenjie but cannot justify her betrayal. I feel her logic was flawed by equating a stronger civilization with a superior one. I did like the character of Shi Qiang. He was abrasive and somewhat uncouth, but he was very smart among all the scientists and felt real to me. All things considered, I give this read 4 stars. As someone with a math and science background, I enjoyed the reading the hard science. I can see where it may not appeal to all readers, but I think there are enough other items that will appeal to lovers of the genre. The premise was believable and it was interesting to speculate how humanity would react to another civilization and how the people separated into different camps. I always thought humans would line up to protect their world, but I can see how some people may have become disillusioned with our society. I do not feel this work is worthy of receiving an award, but it still has something to offer sci-fi fans.